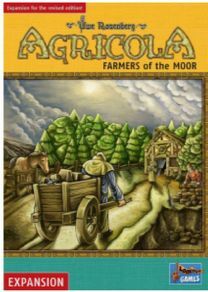 Agricola: Farmers of the Moor, an expansion for the revised edition of Agricola, adds to the base game with a large set of new improvements as well as a number of new features. Now as well as feeding your family every harvest you also have to heat each room of your house to stop your people becoming ill. To help with this you will find your basic farmyard now has forests you can chop down and moors you can cut peat, a new resource in the game. There is also a new animal, horses, these don’t provide much food but can boost some of the new improvements in the game and are of course worth victory points at the end of the game..
What are these new improvements? There are 14 new major improvements and a whole host of more minor improvements. The new majors include Riding Stables, Forester’s Lodge, Horse Slaughterhouse and more. Making use of the new peat and horses. There are also special actions , these cards don’t require a family member to use but they do require you to have a family member available to play. You now get the tricky choice of do you go for a ‘free’ special action and risk losing out on that bundle of resources sitting on the board or that family growth you’ve been planning. These special actions allow you to cut down a forest or cut peat from your moor among others. For those with the five and six-player expansion for the revised edition of Agricola, don’t worry Farmers of the Moor contains enough pieces to cover 5-6 players as well as the basic 4. This expansion adds an extra level of complexity to the base game and is not for the faint hearted as you try to keep on top of heating your house as well as feeding your family and expanding your farm.